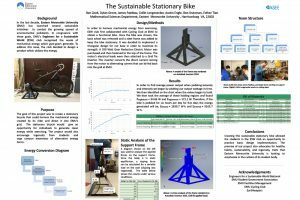 A poster about a stationary bike project at Eastern Mennonite University took top honors among 61 other competitors in the first- and second-year undergraduate design team division at the American Society for Engineering Education’s (ASEE) Zone 2 Conference. 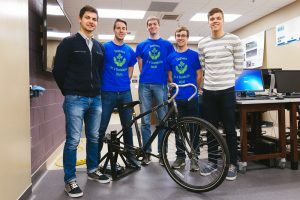 Dylan Grove and James Paetkau, engineering students and members of the Engineers for a Sustainable World (ESW) club, were the primary poster designers. They traveled to the March 2-5 conference in San Juan, Puerto Rico, with engineering faculty members Esther Tian and Daniel King. “This ASEE conference was comprised of engineering programs at large and small universities from over 15 states, so we were quite happy to see our students receive this external validation and encouragement about the quality of their project and presentation,” said King. The win is especially significant considering the competition included large engineering programs from University of Florida, Virginia Commonwealth University, West Michigan University, West Virginia University and Mercer University. Like all ESW projects, the bike and the poster were team efforts. Club members Ben Zook, Collin Longenecker, Austin Engle, Ben Stutzman and Andrew Troyer also contributed to the poster, which was designed during the fall 2016 semester. At the poster session, Grove and Paetkau said professors and judges showed considerable interest in the project itself. Fundings from an Earthkeepers mini-grant helped start the project, which drew on skills, time and labor of several club members, as well as welding provided by physical plant employee Henry Bowser. A 350-watt gear reduction electric motor replaced the back wheel, a chain connected pedals and motor crankshaft, and a grid tie inverter used to convert direct current to alternating current compatible with EMU’s grid. Several attendees at the poster session suggested that storage of the energy was the next step. “More than asking us questions about the project, they gave us suggestions about what to do with the project in the future,” Grove said. “They really pushed us to think about how we could use this project to create change,” Paetkau added. In addition to attending conference activities, the group also did some sight-seeing, including a visit to Arecibo Observatory, a rainforest, one of the island’s three bioluminescent bays, seaside cliffs, and of course, the beach. Though a special treat for all, these excursions were especially interesting to Paetkau, who hopes to focus his engineering studies on biomimicry, an emerging field that seeks to develop innovation based on nature’s models and systems to solve complex challenges. 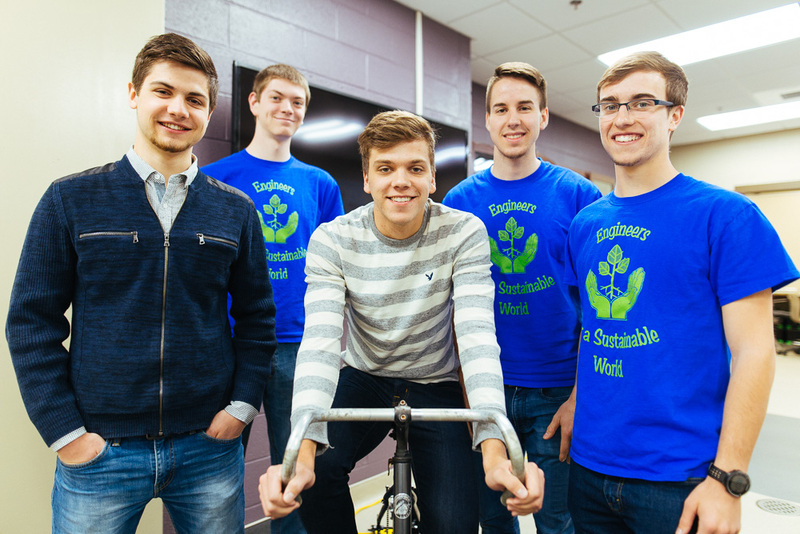 I am pleased to see the focus of the new Engineering Program on sustainability. Congratulations to the students on this award-winning project!